First: this and this. Two articles, one about Barry Zito, written a year too soon, and the other about Matt Cain. Fun for me to re-read, hopefully it is for you too. It all makes sense now. 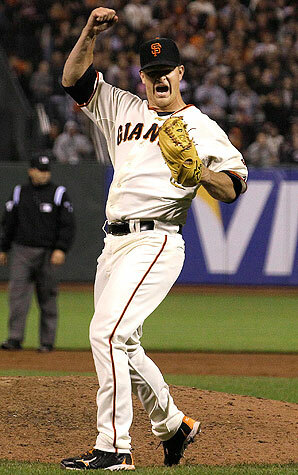 Of course the Giants would sign Matt Cain to a big contract (the biggest to a right-handed pitcher ever. Chew on that for a minute. Then chew on this: how many dominant left-handers are still in the postseason? Not many. Interesting). Of course Matt Cain would throw the first perfect game in Giants’ history. Now maybe he can win the first Game 7. Probably the craziest thing I’ve learned this post-season, and there have been many crazy things to learn, is this: the Giants have never won a Game 7. Not in New York, not in San Francisco. Not in 128 years of baseball. 0 and 5. Two of those game sevens have come in my lifetime. The first baseball season I really remember was 1987, although I don’t have much memory of the post-season. I definitely remember the ’88 post-season. The A’s, the Dodgers. That stupid Gibson home run that I’ve had to watch highlights of all my life. But I don’t remember Game 7, 1987, against the Cardinals, at all. Probably for the best because it was tragic. I do remember, more vividly than I would like, Game 7 against the Angels. The gut-punch of Game 6 was still fresh and you just knew, as much you hoped it wasn’t true, that there was no way they were going to win Game 7. And they never really came close. 2002 was a rough year, and that loss didn’t help. Not one bit. Total depression. It’s 2012 and I live in a different baseball world. If the Giants lose tonight I will be bummed. This team has been so much fun to watch and I would love to see them take on the Tigers. But, I won’t be crushed if they lose. So, here’s to Matt Cain. Back in 2006, when things had taken a turn for the worst, Matt Cain was a Giants’ fan great hope. One day, we dreamed, maybe we’d get to see Cain take the mound in a big playoff game. Our big ace. In our beautiful ballpark. It seemed too good to be true. But now it is happening. Game 7. The greatest show in sports. Of course. Zito. Of course. I’ve included links to several Zito articles because I don’t have much to add to what’s been written. I will say this, though: I have never been more proud of a professional athlete. Everything about that pitching performance is why I love baseball. One other thought: throughout this series, even the Game 2 win, my overall impression has been that the Giants look tired and worn out, while the Cardinals seem alive and inspired. No shame in that, it’s a long season and sometimes you just run out of gas. But last night the team looked fresh. They looked alive. They were having fun playing baseball. And that, more than anything else, give me hope for the rest of the series. We ended the last post with the 2009 Yankees, so lets move on to the Giants! First off, how nasty has the Giants’ pitching been the last two years?! Lets review: the only team we looked at to post even one K/9 rate over 8 was the Diamondbacks. The Giants did it two years in a row! Those same Diamondbacks, who had two Hall of Famers on their staff, matched the 121 ERA+ but only did it once. The Giants did it two years in a row! The 2005 White Sox had the best ERA+ at 125, but nowhere near that in ’04 or ’06. The 2007 Red Sox had an ERA+ of 123, but couldn’t quite match it the next year. The Giants broke 120 two years in a row! And, the best ERA of any other team, regardless of year belongs to the 2005 Cardinals (3.49) which was matched essentially matched by the Giants’ in 2009 and bested this last season. The Giants are a true outlier in my model for a couple of reasons. 1) They didn’t make any significant additions to their staff in 2010…yes they added Javier Lopez, Santiago Casilla, but it was mostly bullpen tweaks. Their big addition: Todd Wellemeyer (we all know how that ended up). 2) They did have a major contributor emerge over the course of the season in Madison Bumgarner (his 136 ERA+ was actually the best of any of the starters in ’10). That said, MadBum didn’t explode on to the scene they way Pavano did in 2003, or Lackey in 2002, or Garland in 2005 (this is actually a good thing, as I will explain later, but essentially he wasn’t extremely overworked as the 4th starter). 3) Like the Yankees the year before, the Giants break the mold a bit in that their ability to get to the postseason had more to do with their offense than pitching. It is in the regular that a good offense really shows up as significant predictor of success. The real important additions were Huff, Burrell, Posey, Torres, and Ross who allowed the Giants to scrape together enough runs to get four more wins. Once in the playoffs the Giants ridiculous pitching took over (which fits the BP model for playoff success to a T). I said in yesterday’s post, the pattern for World Series Championships tends to be this: an average staff makes a couple of key additions, sees a few young arms emerge, and experiences a significant bump in production. This bump caries the team to the title, but it also has proven to be unsustainable. Many championship teams have seen a major drop off in pitching production in their title-defending season torpedoing their ability to repeat. Most of this drop off has to do with injuries and fatigue and a lack of the same type of talent infusion the team experienced the season before. For example, the 2004 Red Sox saw a huge bump in production (13 pts of ERA+) with the additions of Curt Schilling, Bronson Arroyo, and Keith Foulke. They added more arms the next year in Matt Clement and David Wells, but neither provided the same bump. On top of that, the Sox lost Schilling for most of the year due to the injury (bloody sock) he suffered in the 2004 playoffs, Pedro Martinez to free agency, and saw the beginning of the end of Keith Foulke (who pulled a Robb Nen in sacrificing his shoulder for the sake of the WS). For teams hoping to make the jump to the WS it would behoove them to add pitching. If they are lucky enough to pull it off, they then need to add even MORE pitching and hope their guys stay healthy and strong for another long season. Based on these findings, I see a ton of red flags for the 2011 Giants. They have made no significant additions to their staff. Furthermore, Lincecum and Sanchez profile as the type of pitchers who might not rebound as well from their extended seasons. Tim Kawakami wrote a great article back in August about Lincecum’s astronomical pitch numbers, and it was clear to anyone watching (and confirmed here) that Sanchez ran out of gas at the end of THIS season, which doesn’t bode well for the next. The Giants’ staff seems poised for a classic post-World Series hangover drop in production. 1) The Giants are clearly unique in their pitching superiority. No other team trying to repeat in the last 10 years has (a) been able to bring all the key players back and (b) had such a nasty staff. One of the things that made the Giants so good is their lack of a weak link (Zito is the obvious objection, but as a 5th starter he is unparalleled, both in quality and salary). Even if the Giants regress a bit as a staff they will still be better than a lot of the staffs that won WS in the last 10 years. 2) The Giants’ offense could potentially be a lot better over the course of the whole season this year. A full season of Posey/Ross/Sanchez, repeat performances by Burrell/Huff/Torres, a bounce back season from Sandoval, and the emergence of Brandon Belt could produce a better than league average offense for the first time since Bonds left. Improved offense and a regression on the mound could balance out to the same regular season results. Then the G-men will just have to hope for the magic in the postseason. 3) I have legitimate concerns about Sanchez, but I continue to marvel at Lincecum. Everything about him and how he’s been used to this point screams tommy john surgery in the near future. However, maybe he really is a freak. He is in great shape and has never had an arm injury, ever! Perhaps he’s just blessed in bizarre ways and 2011 will be business as usual. We will have full prediction posts in March when the season is a lot closer, but here’s where I am at currently. I do think the Giants pitching will regress overall but not significantly (think an ERA+ of 112 and a K/9 of 7.5). As good as they were last year they did give 15 or so starts to Todd Wellemeyer and had some bullpen issues early (Romo and Affeldt struggled early and Affeldt never came close to his 2009 form…if he comes back healthy and strong that will provide another significant internal addition). I also think the Giants will score a lot more runs this year with a nice season for Pablo, depth in place at the start of the season (not just at the end), and the jolt Belt will provide when he does his Posey imitation this summer. That said, I see them running out of gas in the postseason. Several NL teams have followed “my plan” well this offseason. The Phillies are the obvious offenders, but watch out for the Brewers (big additions), the Reds (big emergence potential), and even the Cubs (especially if this is true), Marlins (addition and emergence), and Dodgers (addition and emergence). Also, don’t forget about the Rockies/Braves/Nationals who all improved in various ways over the offseason, plus they have some young players who should continue to mature. Also, the Cardinals still have a few good players. All that to say, the NL is going to be TOUGH this year, which means the Giants probably need to improve on both sides of the ball. The problem: that just hasn’t happened with returning Champions in a long time.